pathetic experience Pros :- Very hard to find All we faced is cons only: - Front desk ataff is very very rude like they dont care weather customer comes or not . - They puts white towel and in rooms then they askd for charging of getting staind. - They Provide higher floors to chinese people only, thats very pathetic. - They charges us for missing hair dryer actualy later on they have found from rooms only. do not book these hotel plenty of good one arround beach area. Great hotel close to LK METRO. Very affordable rates stunning views of Pattaya City. Bell boys great fun. We arranged transfers to the Airport nice cars an cheap 1500THB. Rooms very clean, tv all major channels. Air con excellent. Breakfast good. Located on Pattaya 3rd Road, Lk Presodent is about 200 or 300m from Soi Bukhao and LK Metro. While not in the action and the late night noise, it is still close enough that everything in the main tourist areas ia walkable. This guy is one of the best front of house guys i have ever came across in all of my travels / life. An asset to the LK Group. He feels like a brother from another mother...because of this guy i shall be directing lots of my friends from the gas and oil industry to the LK President. a good clean hotel with nice food and a good location for Pattaya. In my humble opinion Jean should run a classroom on how to be the best in the hotel industry....keep being yourself young man . Imagine a hotel which has room sizes of a 5 star and a basic service of a ibis business hotel. Being in Pattaya, this is what is required as most of the time is spent the night and around the beach area. For a vegetarian to find 3 different things to eat, other than bread and fruits is seriously a huge positive. The rooms are spacious and bright, though sound proofing could be a little better. Otherwise a nice bright modern hotel, with a little old world charm. A special mention to the front desk lady "FON" for going out of the way to solve an issue. Stayed 10 nights in February. Location excellent for nightlife, markets and restaurants. Cons. Extremely poor wifi, hard bed, TV poor, housekeeping sloppy. Didn't replace tea or coffee set on 4 occasions. Dirty shower curtain.In room safe failed Good size room but dat,ed. No balcony. Staff mainly indifferent and while reception friendly very poor English. When booking in not shown to lifts let alone room or told where restaurant located. Breakfast is a joke. No Western food other than eggs, usually cold, and Asian food indifferent. Much better value to be had elsewhere. One last thing. Room booked for two but only two pillows. I asked for two more but was told I could have one but would need to pay extra for a 4th!!!!! I've travelled the world and never had that before. We had an excellent stay here. Hotel had nice location with super rooms with nice view. We stayed at 23 floor. Breakfast was excellent and special mention to friendly staff. One person of our group had to cancel the trip and Fon at reception was very helpful in cancelling the room for us, even though our bookings were non cancellable. A big thanks to her. Will stay at this hotel again when in Pattaya. 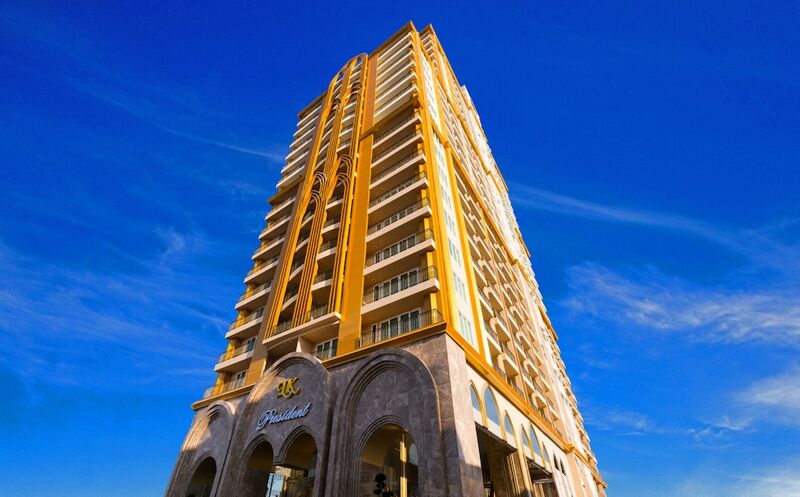 Located in Central Pattaya, LK President is a leisurely stroll from popular sights such as Central Festival Pattaya Beach and Pattaya Beach Road. This 3.5-star hotel has 190 rooms and welcomes guests with a restaurant, an outdoor pool, and free in-room WiFi. For your convenience, a buffet breakfast is served for a fee each morning from 7 AM to 11 AM. Savor a meal from the comfort of your room with room service, or grab a bite to eat at the onsite restaurant. Guests can expect to find free WiFi and 40-inch an LCD TV with cable channels and a DVD player. The bathroom offers a rainfall showerhead, hair dryers, and free toiletries. Other standard amenities include a balcony or patio, a sitting area, and a refrigerator. Guests staying at LK President enjoy an outdoor pool, a fitness center, and free WiFi in public areas. You can take advantage of free parking, along with an airport shuttle (available on request) for THB 2000 per vehicle one way. The 24-hour front desk has multilingual staff ready to assist with concierge services and dry cleaning/laundry. Additional amenities include a computer station, free newspapers, and a terrace. Onsite venue - Restaurant specializing in Thai cuisine. Open daily for breakfast and lunch. Recreation features at LK President include an outdoor pool and a fitness center. The preferred airport is Bangkok (BKK-Suvarnabhumi Intl.). The front desk is open 24 hours a day. For convenient arrivals and departures, you can take advantage of the airport shuttle (available during limited hours), which is offered for a fee. Driving? This property offers free parking. Airport transportation is available on request from 9 AM to 10 PM. Fees may apply. Guests must make arrangements in advance by contacting the property. This hotel provides transfers from the airport (fees apply). To make arrangements, contact the property with arrival details 24 hours prior to arrival, using the phone number on your booking confirmation.